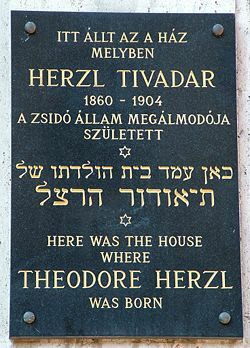 Theodor Herzl (May 2, 1860 – July 3, 1904) was an Austro-Hungarian Jewish journalist and playwright who became the founder of modern political Zionism. His Hebrew personal name was Binyamin Ze'ev. The Dreyfus Affair convinced Herzl that assimilation into European society would not protect Jews from anti-Semitism and that the creation of a Jewish state was the only solution. He did not argue initially for a return to the land of Israel, although he came to advocate this. His advocacy of a Jewish state was nationalistic rather than religious, predicated on the belief that Jews were a nation. The later myth that Palestine was a “land without a people for a people without a land” dates from his conviction that Palestine was a desolate, barren land waiting for Jews to bring civilization to the few Arabs who lived there and who would be grateful for their help. On the other hand, millions of Jews have found dignity, security and refuge in what was their ancient homeland, often fleeing from repression elsewhere. Herzl was born in Budapest. He settled in Vienna in his boyhood, and was educated there for the law, taking the required Austrian legal degrees, but he devoted himself almost exclusively to journalism and literature. As a young man, he was engaged in the Burschenschaft association, which strove for German unity under the motto Ehre, Freiheit, Vaterland ("Honor, Freedom, Fatherland"). His early work was in no way related to Jewish life. He acted as correspondent of the Neue Freie Presse in Paris, occasionally making special trips to London and Istanbul. His work was of the feuilleton order, descriptive rather than political. Later he became literary editor of the Neue Freie Presse. 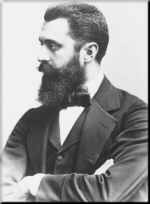 Herzl was also a writer for the Viennese stage, furnishing comedies and dramas. From April 1896, when the English translation of his Der Judenstaat ("The Jewish State") appeared, his career and reputation changed. He became the leading spokesman for Zionism. It is widely believed that Herzl was motivated by the Dreyfus Affair, a notorious anti-Semitic incident in France in which a French Jewish army captain was falsely convicted of spying for Germany. Herzl had been covering the trial of Dreyfus for an Austro-Hungarian newspaper and witnessed mass rallies in Paris right after the Dreyfus trial, where many chanted "Death To The Jews! "; this apparently convinced him that it was futile to try to "combat" anti-Semitism. In June 1895, in his diary, he wrote: "In Paris, as I have said, I achieved a freer attitude toward anti-Semitism, which I now began to understand historically and to pardon. Above all, I recognized the emptiness and futility of trying to 'combat' anti-Semitism." In France and elsewhere, Jews had been granted full civil rights and many, especially progressive Jews, advocated assimilation. The Dreyfus Affair suggested that full civil rights would not prevent persecution. During World War II, the most assimilated Jews in Europe bore the brunt of the Holocaust and were stripped of their citizenship. This, for many, proved that Herzl was right and gave the final impetus to the creation of the modern state of Israel (1948). Even during the second half of the twentieth century, Israel provided a safe haven for Jews fleeing persecution in the Soviet Union, where Judaism was suppressed and Jews executed, especially during Stalin's leadership, when the claim that Jews were cheats and liars was perpetuated. However, for the past several decades historians have downplayed the influence of the Dreyfus Affair on Herzl, even terming it a myth. They have shown that, while indeed upset by anti-Semitism evident in French society, he, like most contemporary observers, initially believed in Dreyfus's guilt and only claimed to have been inspired by the event years later when it had become an international cause. Instead, the rise to power of the anti-Semitic demagogue Karl Lueger in Vienna seems to have had a greater effect on Herzl in 1895, a time when the pro-Dreyfus campaign had not really emerged and Dreyfus' guilt was generally conceded even by French Jewry. In any case, around this time Herzl grew to believe that anti-Semitism could not be defeated or cured, only avoided, and that the only way to avoid it was the establishment of a Jewish state. His forerunners in the field of Zionism date through the nineteenth century, but he was perhaps unaware of this. Herzl followed his writing with serious work. He was in Constantinople in April 1896, and on his return was hailed at Sofia, Bulgaria, by a Jewish delegation. Five days later he was given the mandate of leadership from the Zionists of the East End of London, and within six months this mandate was approved throughout Zionist Jewry. His life now became one unceasing round of effort. His supporters, at first a small group, literally worked night and day. Jewish life had been heretofore contemplative and conducted by routine. Herzl inspired his friends with the idea that men whose aim is to reestablish a nation must throw aside all conventionalities and work at all hours and at any task. In 1897, at considerable personal expense, he founded Die Welt of Vienna. Then he planned the first World Zionist Congress in Basel. He was elected president, and held as by a magnet the delegates through all the meetings, being unanimously reelected at every following congress. In 1898 he began a series of diplomatic interviews. He was received by the German emperor on several occasions. At the head of a delegation, he was again granted an audience by the emperor in Jerusalem. He attended The Hague Peace Conference, and was received by many of the attending statesmen. In May 1901, he was for the first time openly received by Abdul Hamid II of Turkey, but the sultan refused to cede Palestine to Zionists, and said, "I prefer being penetrated by iron to seeing Palestine lost." In 1902–1903 Herzl was invited to give evidence before the British Royal Commission on Alien Immigration. As a consequence, he came into close contact with members of the British government, particularly with Joseph Chamberlain, then secretary of state for the colonies, through whom he negotiated with the Egyptian government for a charter for the settlement of the Jews in Al 'Arish, in the Sinai Peninsula, adjoining southern Palestine. From the early 1880s, Russian Jews supported by wealthy French and British Jews had started to buy land and to settle in Palestine. Between 1882 and 1903, approximately 35,000 Jews emigrated. British support for a Jewish homeland would be expressed in the Balfour Declaration and in the mandate for administering Palestine under the League of Nations, although what the British had in mind was a client-state. On the failure of that scheme, which took him to Cairo, he received, through L. J. Greenberg, an offer (August 1903) on the part of the British government to facilitate a large Jewish settlement, with autonomous government and under British suzerainty, in British East Africa (Uganda). At the same time, the Zionist movement being threatened by the Russian government, he visited Saint Petersburg and was received by Sergei Witte, then finance minister, and Viacheslav Plehve, minister of the interior, the latter of whom placed on record the attitude of his government toward the Zionist movement. On that occasion Herzl submitted proposals for the amelioration of the Jewish position in Russia. He published the Russian statement, and brought the British offer, commonly known as the "Uganda Project," before the Sixth Zionist Congress (Basel, August 1903), carrying the majority (295 to 178, 98 abstentions) with him on the question of investigating this offer. Whereas his first brochure and his first congress address lacked all religious thought, and his famous remark that the return to Zion would be preceded by a return to Judaism seemed at the moment due rather to a sudden inspiration than to deep thought, subsequent events have proved that it was a true prophecy. His last literary work, Altneuland (in Eng. The Old New Land), is devoted to Zionism. The author occupied his free time for three years in writing what he believed might be accomplished by 1923. It is less a novel—though the form is that of romance—than a serious forecasting of what can be done when one generation shall have passed. The keynotes of the story are the love for Zion, the insistence upon the fact that the changes in life suggested are not utopian, but are to be brought about simply by grouping all the best efforts and ideals of every race and nation; and each such effort is quoted and referred to in such a manner as to show that Altneuland ("Old-New land"), though blossoming through the skill of the Jew, will in reality be the product of the benevolent efforts of all the members of the human family. Herzl envisioned a Jewish state that was devoid of most aspects of Jewish culture. He did not envision the Jewish inhabitants of the state being religious, or even speaking Hebrew. Proponents of a Jewish cultural rebirth, such as Ahad Ha'am, were critical of Altneuland. Herzl did not foresee any conflict between Jews and Arabs. The one Arab character in Altneuland, Reshid Bey, is very grateful to his Jewish neighbors for improving the economic condition of Palestine and sees no cause for conflict. The early supporters of Jewish settlement in Palestine, whose beliefs were more socialist than religious, argued that this would benefit the Arabs as well by creating thriving agricultural communities. The name of Tel Aviv is the title given to the Hebrew translation of Altneuland by the translator, Nahum Sokolov. This name, which comes from Ezekiel 3:15, means tell—an ancient mound formed when a town is built on its own debris for thousands of years—of spring. The name was later applied to the new town built outside of Jaffa, Israel, which went on to become the second-largest city in Israel. Nearby is Herzliya, named in honor of Herzl. Bein, Alex. Theodore Herzl: A Biography. Philadelphia: The Jewish Publication Society of America, 1940. Pessin, Deborah. Theodore Herzl. New York: Behrman House, 1948. Desmond, Stewart. Theodore Herzl: Artist and Politician. New York: Doubleday, 1974. This page was last modified on 21 February 2014, at 17:24.